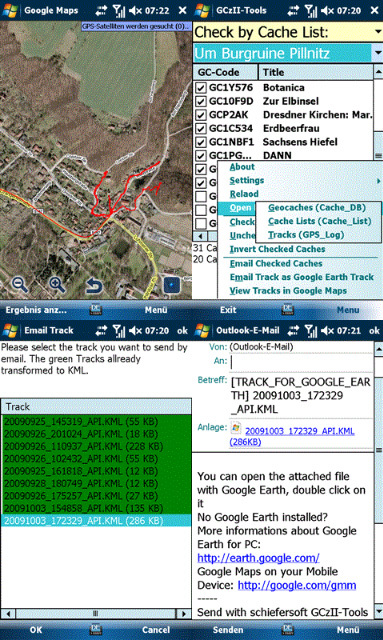 GCzII-Tools lets you email your cache lists or manually selected geocaches to your geocaching Tour Partners, or you can inform friends about found Geocaches with all necessary information�s very easy. GCzII-Tools is build for creating more functions which not in GCzII build in. if you have wishes for functions which Tom don�t like to build in then give me a message. I had the same problems. After I download version 0.2.35.50 all problems are solved! Great working! greetz Paienne. I like the tool BUT when I search for caches nearby I get a nice list but when I select one to open the open the cache-page I get the error 'Can not open cache'. I have the tools installed as well. What can it be? Is it something with my phone (Acer F900 with WM 6.1)? i think thats a good add for GCzII (the best GeoCaching Software in the world) this adds some usefull functions: -GEO TAG PHOTOS !!! -send them as KMZ File!! -email tourdates (GC Tours with all caches) to your geocaching partner in preparation of the tour -view (or email) your taken tour as a track file and more thanks to schiefersoft for that good work! Tried it (as I us GCz_II), but I can't see that it adds anything useful.